According to the Journalist Samuel P. Jacobs (hyper-link provided in post title): One of the books President Obama is reading (or has read this year) is about Valentino Achak Deng; "the real-life hero of this engrossing epic." Deng is one of the renowned Lost Boys of Sudan - a Somalian refugee - who has been relocated to Atlanta. As fate would have it, Deng becomes a victim of urban crime when he experiences a home invasion. 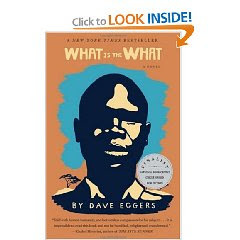 Dave Eggers, the novelist; recieves rave reviews for his best-seller. "Valentino Achak Deng, real-life hero of this engrossing epic, was a refugee from the Sudanese civil war-the bloodbath before the current Darfur bloodbath-of the 1980s and 90s. In this fictionalized memoir, Eggers (A Heartbreaking Work of Staggering Genius) makes him an icon of globalization. Separated from his family when Arab militia destroy his village, Valentino joins thousands of other "Lost Boys," beset by starvation, thirst and man-eating lions on their march to squalid refugee camps in Ethiopia and Kenya, where Valentino pieces together a new life. He eventually reaches America, but finds his quest for safety, community and fulfillment in many ways even more difficult there than in the camps: he recalls, for instance, being robbed, beaten and held captive in his Atlanta apartment." "At a time when the field of autobiography seems dominated by hyperbolic accounts of what might be called dramas of privilege (substance abuse, eating disorders, unloving parents, etc. ), What Is the What is a story of real global catastrophe -- a work of such simple power, straightforward emotion and genuine gravitas that it reminds us how memoirs can transcend the personal to illuminate large, public tragedies as well."